Trumpcare Isn’t Health Care. It’s a Tax Cut for the Wealthy. And maybe that’s the whole point of the bill. For seven years, demolishing the Affordable Care Act has been the GOP’s animating crusade. By the time Donald Trump was elected, House Republicans had voted more than 60 times to repeal the law. But apparently, they didn’t think much about what would replace it. As Trump recently discovered, health-care reform turns out to be “complicated.” But what the GOP finally proposed isn’t a health-care plan—it’s a tax cut for the wealthy, paid for by throwing Grandma under the bus. According to the Congressional Budget Office, 24 million people would lose their insurance by 2026 if the American Health Care Act becomes law, with 14 million losing their coverage next year. Ironically, the GOP bill adopts Obamacare’s essential framework, relying on tax credits to cushion the cost of insurance. But because of the way the AHCA structures those credits—by age, and without regard to income or geography—the poor and the elderly in high-cost markets will be the hardest hit. That change, combined with a provision freeing insurers to charge older people up to five times what they charge younger customers, means that a 62-year-old scraping by on $18,000 a year in Nebraska’s Chase County could see her annual premium jump from $760 under the ACA to $20,000 under the Republican plan, according to a projection from the consulting firm Oliver Wyman. The AHCA also preserves some of Obamacare’s popular provisions, including the ban on discrimination based on preexisting conditions and gender. But the bill overall is a huge, incoherent mess. Consider its substitute for the much-decried individual mandate. Instead of paying a tax penalty for failing to buy insurance, people would pay a 30 percent surcharge on their premiums if they experience a gap in coverage of two months or longer. Perversely, this penalty would discourage people who have dropped out of the health-insurance market from reentering unless they are sick. Along with reduced premium subsidies, it’s a recipe for the very “death spiral” that Republicans have warned about. Who does the law help? The richest 400 households in America, which will each receive an average annual tax cut of $7 million. Health-insurance CEOs get a handout too: By increasing the amount of executive pay that companies can deduct from their taxes from $500,000 to $1 million, the GOP plan encourages bloated compensation packages. And younger, wealthier people shopping on the individual marketplaces may see lower rates and higher subsidies. For everyone else, there is little to love about the Republican plan. It fails to meet President Trump’s basic promise of “insurance for everybody.” It also fails to satiate the far right’s blood lust for a complete gutting of the ACA. It punishes the GOP’s own base—working-class, elderly, and rural Americans, particularly in states that Trump won. 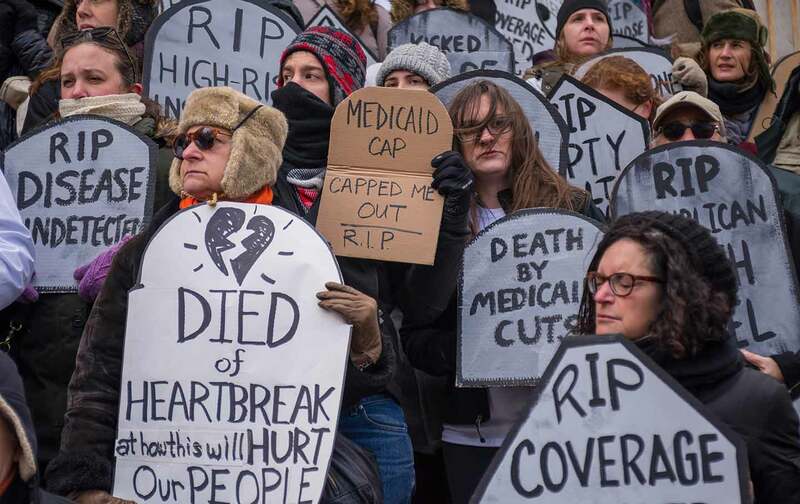 It upends the financial structure of the entire Medicaid program, which covers 68 million people. And it eliminates a mandate for coverage of mental-health and substance-abuse treatment. It’s tempting to mock the GOP’s botch job—and in particular House Speaker Paul Ryan, the supposed wonk-wunderkind who recently revealed that he has no idea how insurance works. “The people who are healthy pay for the people who are sick,” he complained, referring to Obamacare, as if that weren’t the basic premise of insurance. But messy as it is, the AHCA does exactly what Ryan intended: tear holes in the safety net for the poor while making life easier for the rich. Yet with every major doctors’ and hospital group opposed to the law, and a number of Republicans suddenly feeling queasy about depriving their constituents of insurance, there’s a real possibility the effort will collapse on its own. Republicans are caught in a bind between past promises and future consequences. Still, their predicament pales in comparison with that of those people whose lives are, quite literally, in the balance.